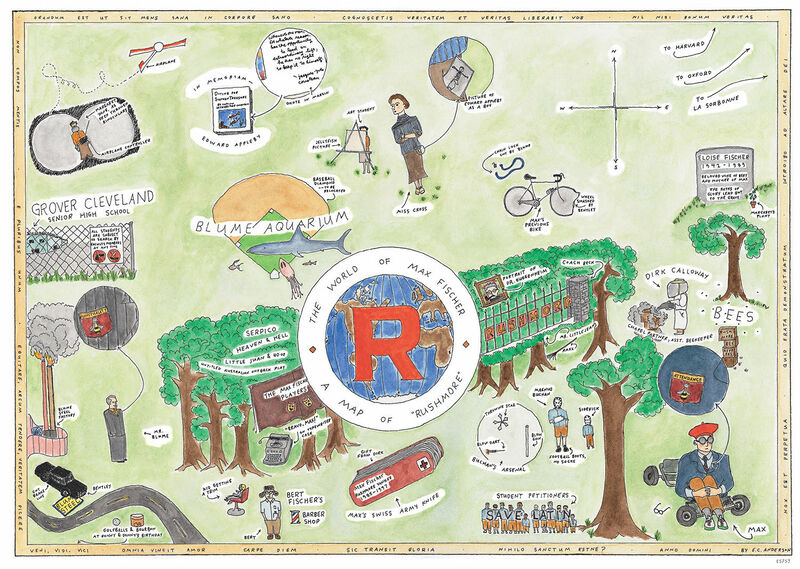 The auteur's brother Eric Chase Anderson on how a 20-year-old doodle inspired his illustrations for this year's anniversary reissue of Rushmore. 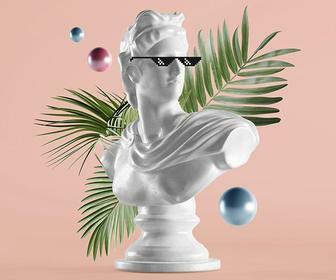 1998 is a year of many interesting anniversaries across the worlds of art, design and music, and Digital Arts has been covering some of the most essential ones as we head towards 2019. As the year closes out, we have a hallmark from the world of cinema - one from probably this century's most stylish auteur, and one being marked on a new Blu-ray release with some equally stylish artwork by the same director's brother. 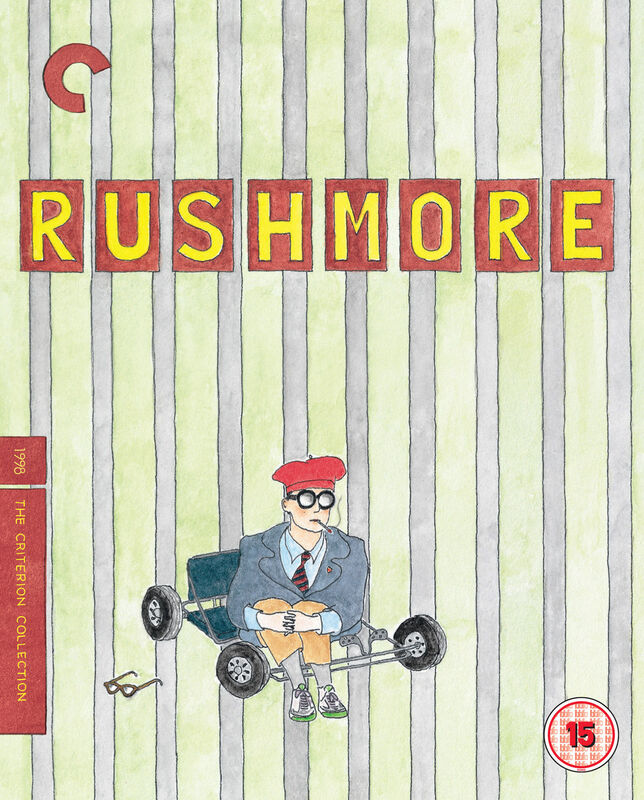 We're talking about the 20th anniversary edition of Wes Anderson's sophomore classic Rushmore, as being released by the formidable Criterion Collection with new cover art by Eric Chase Anderson. 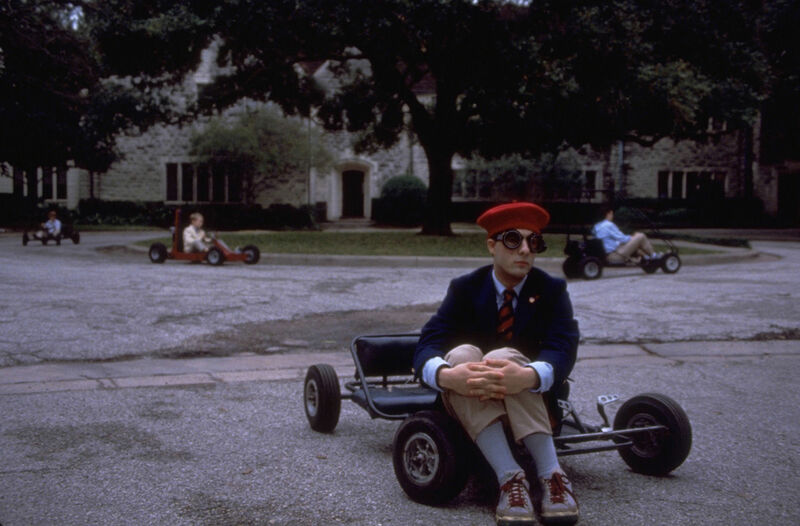 A 90 minute tale of Jason Schwartzman's teenage protagonist going up against Bill Murray's tycoon villain all in the name of love, Rushmore is arguably when Wes Anderson began to show his stylistic, whimsical colours - and in the same way Eric's sleeve is certainly a treat for the eyes. 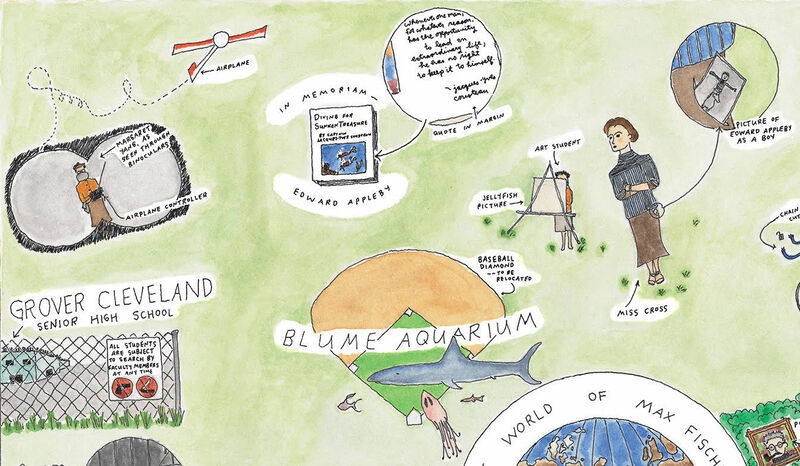 Speaking to Digital Arts, the illustrator and actor explains how the new artwork actually stems from an old map he drew in 1998, as inspired by the film. "Creating a map," he begins, "an idea which arose from maps I had been making on my own, was something that my brother, during post-production of the movie, settled on as a unique gift idea. That's what the 'Rushmore Map' (below) was intended for initially. A gift. But making it seemed to strike sparks for Wes - for me, too. "Wes seemed to sense more and more possibilities and ideas from what I was doing. So that, at one moment, I would be making a gift not officially connected to the movie - and the next, a cover for the Criterion DVD edition." The map has lent itself for use on packaging and inserts, and as a template for Criterion to make what Eric dubs a 'looks-like-my-handwriting-typeface' to use, along with the on-screen digital menus on the disc. "That's what it was like for me," Eric says. 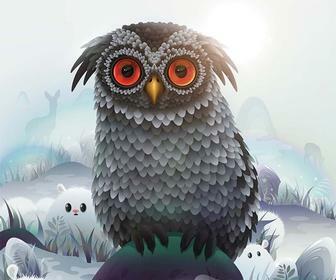 "Just one phone call after another, bringing more and more ideas." The artist feels the map created such an impression with its timeless, hand-drawn nature, harking back to forgotten principles of aesthetic. I think possibly the art materials themselves reminded both of us of things the design world seemed to have discarded," he says. "The look and feel of watercolour paints (for example), of hand-drawn inked lines, of the texture of artists' paper, and of the potential all these familiar things had for a kind of simplicity and directness. It was almost like they were artefacts being re-discovered from times we barely remembered." 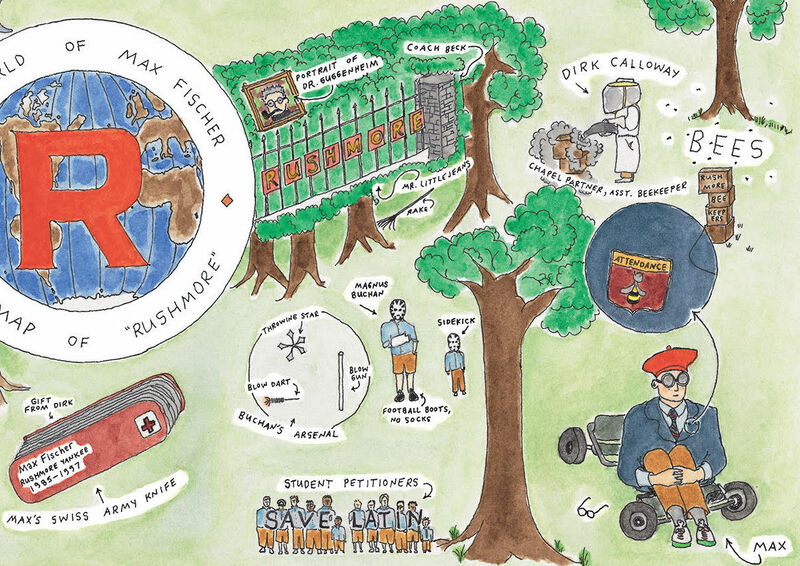 A corner of the map is what we see on the Criterion cover, with our hero Max Fischer sitting in a go-cart as below; this was down to issues incorporating the map as a whole for the sleeve. "I'd been supplied with still photographs from the production," Eric remembers. "One of them was of Max sitting in his go-cart and wearing his goggles; another was of him standing in front of the school sign, the letters mounted on an iron fence. These two things are what went into the cover: Max in the go-cart and the "R U S H M O R E" lettering on separate vertical posts - posts that seemed to want to just become something closer to stripes and for the background to become not quite anything other than perhaps green grass. In our age of streaming, it can be easy to take for granted great presentation of physical media. When asked if such art treats cinema with reverence as opposed to being yet another slab of data and content, Eric agrees - even if he doesn't own a Blu-ray player himself. "I certainly use and prefer physical media like DVDs (though), and I love any resurgence of it in whatever form it takes, such as music on vinyl. 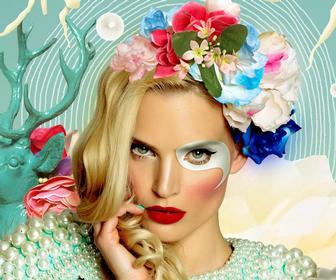 "Treating the packaging and presentation of something as potentially meaningful, wanting to make it feel like a 'gift,' only seems to become more important to me as the years go by. So it's wonderful to have been involved with the Criterion Collection, because they seem to epitomise that spirit of treating movies as an opportunity to cobble together these lovingly-made storytelling treasure chests." Two long decades have passed since Rushmore's initial release - and while streaming may now reign over physical media, and Eric may have amassed a considerable body of work over the years, the film still remains a poignant project for him. "Looking now at the artwork I made for Rushmore is both rewarding and complex," he tells us. "It's like seeing a high school yearbook photo. It was you, but it's not quite you anymore. "What immediately strikes me is both how similar and how unlike those drawings are to what I would be doing only a few years later, or to what I do now. The look of the drawings I make has certainly evolved. I still love making little textual remarks accompanied by little arrows. And despite the passage of two decades, I am still drawn to almost exactly the same, classic artists' materials as then. A love of their warm and tactile effect has stayed with me. "What's ironic is that Rushmore is a movie about school, and I have a hunch that, for me, working on it served a kind of art school function." 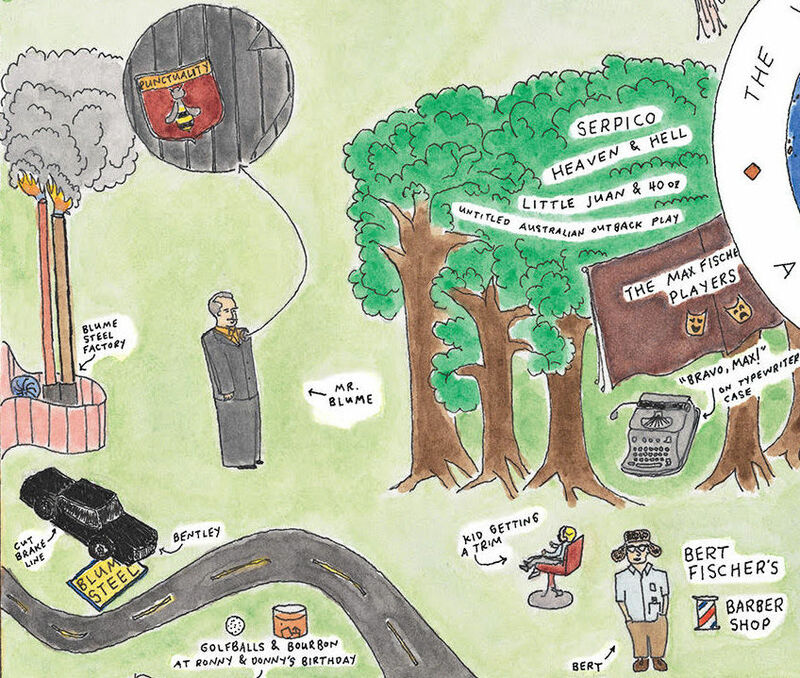 And any readers curious as to where the original Rushmore map has got to, the answer is simple - Wes has it. "It's framed and on his wall," Eric confirms. "I do recall him being kind of taken aback by the cluster of characters proudly arrayed behind the 'SAVE LATIN' slogan. It wasn't something we'd talked about, it was something which just emerged; an outcropping of the universe of his story." Rushmore is out now on Blu-ray through The Criterion Collection.